I heard the good news from the Director of Water and Sanitation for Africa, Mr. Idrissa Doucoure, at a sustainability framework workshop in Acrra, Ghana, on April 3, 2012: Ghana had achieved its Millennium Development Goal for water supply. But, Mr. Idrissa was quick to add that a high percentage of water coverage and access to an “improved source” of water today did not mean that the goal of “sustainable access to safe drinking water” has been met for the years ahead. A week after the workshop, on my way from Cheshei to Tamale in Northern Ghana I spotted a water tanker delivering water at Zouzugu, a rural community about 15 Km south of Tamale. 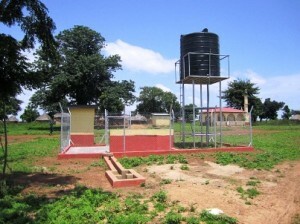 Zouzugu is a rural community near Tamale and had an elevated tank (see photo below) that was supposed to store water from the main Tamale water supply network for the community to use. Unfortunately, the community receives water once a week for few couple of hours with very low pressure that is not enough to push water up into the tank. Sometimes there is no water flow at all in the community for several weeks. 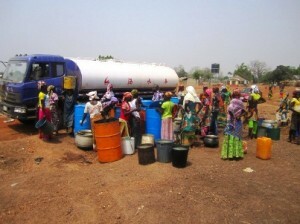 The tanker service (see photo above) has now become the most reliable water supply source for the community. The tanker sources polluted water from a local pond. Interestingly, community members are willing to pay 1 Ghana Cedi for a 50 gallon-drum and 10 Ghana pesewas for a 20 liter container locally referred to as “Gariwa.” A lady in the community (anonymous) said, “The water is not clean and we have to filter and drink.” When asked if filtering with a cloth was enough to make the water clean, she said, “We have no knowledge of other technologies except boiling which is time consuming and expensive considering the fact that there is no firewood in our community.” I recalled Mr. Doucoure’s message as I realized that Zouzugu is part of the statistic that shows that Ghana has achieved the MDG for water supply, even though the community clearly does not have access to sustainable potable water supply. 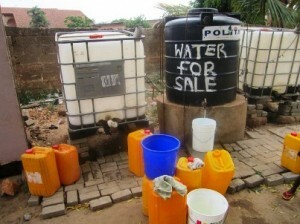 Similarly, in some suburbs of Accra, Ghana’s capital, there are many spots where water tanks display the inscription “water for sale” (see photo below). The owners of these tanks buy water from tanker service providers and store it for re-sale to their community. 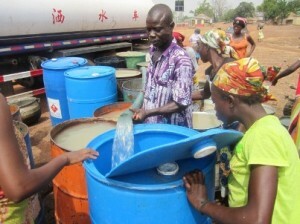 Community members go to them with jerry cans and buckets to purchase water. Regarding the water quality, one of the vendors who spoke on condition of anonymity said, “We believe the water is clean, but as to whether that is true or not, we have no way to prove.” Even if the water from the tanker is clean, contamination could occur in the process of transferring water from the tankers into the water tanks or during the transport of water to individual homes using open containers. From these stories it became clear that “access” to water supply and coverage may reduce if the water facility is dysfunctional. Because the technical and institutional reasons for non-functioning are beyond the scope of community members, access to knowledge of affordable household water treatment could improve or maintain the statistics – and reality – of access to potable water coverage.